Time to get Amazon Kindle Voyage from Singapore. Amazon has finally released the new Kindle Voyage, together with the launch, there are total of 5 all-new Kindle members introduced, namely Kindle Voyage, Kindle basic with touch, upgraded Kindle Fire HD, upgraded Kindle Fire HDX and Kindle Fire HD Kids Edition. Amazon Kindle Voyage is considered another big splash in Kindle e-ink reader since the release of Kindle Paperwhite in 2012. However, same as usual, all Kindles could not ship directly to Singapore from US Amazon. 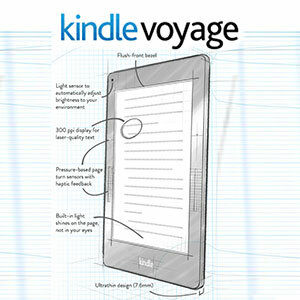 Official details of Kindle Voyage can be found here. At first glance, the outlook of Amazon Kindle Voyage is finished with flush glass in front and matte magnesium at the back, much like the Kindle Fire HDX. The Kindle Voyage (180g) is slightly lighter than the Paperwhite (206g), and thinner too (just 0.1mm thicker than an iPad Air). The main spot light shines on its screen, Amazon has successfully increased the screen resolution of Kindle Voyage to an incredibly high at 300 pixels per inch. Even the smallest text size looks sharp on the 6 inches screen, and with higher contrast too, it appears to be slightly whiter than Kindle Papepwhite. The screen is now made of glass instead of plastic, this chemically hardened glass plate has been ‘micro-etched' with matte surface, it is non-reflective even under the sunlight, according to Amazon, it is very close to paper texture. There is an ambient light sensor installed on Voyage, it will detect the surrounding light and adjust the screen brightness smartly without affecting your reading. You can always turn off the auto sensor should you need a fixed brightness instead. As speculated in the previous rumors about new Kindle release in 2014, Amazon did include the page-turn button in this Kindle Voyage. However, instead of physical buttons, Voyage is equipped with the so called “PagePress” sensor. The sensors are located at both sides of the device, to turn a page, you just need to simply press (squeeze) the left or right bezels of Kindle Voyage, the sensor will detect your pressure and execute the page-turn, and the device will also respond to you with a subtle vibration when PagePress is executed. Of course, you have the flexibility to disable the vibration and adjust the sensitivity of the sensor. In term of software, the Kindle Voyage is packed with some new tricks, an interesting feature called “Word Wise” allows you to expands space between the text and displaying the little hints about the meaning of particular words in the contents. The X-Ray is now including an image browser for all picture titles, and notable passages. Another interesting feature is the Family Library, which allow the connection between different Amazon accounts of family members to borrow certain types of eBooks from each other. The device storage is also increase from 2 gigabytes to 4 gigabytes for you to hold more books. Certainly, the Kindle Voyage was specially catered for people who like reading a lot. It is thinner and lighter, better screen and turn-page feature. 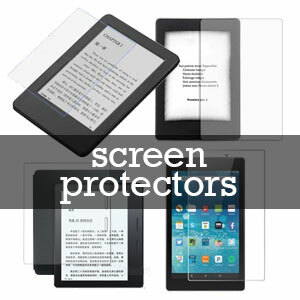 This is clearly a premium e-reader that comes with premium price, Wi-fi model price at US$199, 3G model at US$269, and US$20 extra to get rid of special offer ads. The Amazon Kindle Voyage is now open for pre-order and have it ship to Singapore via package forwarder. Click here to see the latest price. If you find Kindle Voyage is too expensive, worry not, Amazon is still selling the All New Kindle Paperwhite at US$119 which has not much noticeable changes in the hardware except the upgrade of storage to 4 gigabyes. You can get it here. As for the basic new Kindle, it is now with touch screen features too, selling only at US$79 here. If you are not sure how to buy from Amazon US and have it ship to Singapore, you can read the Kindle buying instruction here.